As much as I love you guys, I’m not up for going out and rewatching all the least interesting episodes/sections of every single Henry/six wives production. The problem is that I’m not the only one who finds Jane Seymour boring — aside from the few movies or TV series that have given equal time to all the wives, Jane is lucky to get ANY dialogue in most of these productions! I did make a point to watch or rewatch SUBSTANTIVE appearances, but if she’s just in the background of one scene, nope. That’s on the filmmakers. 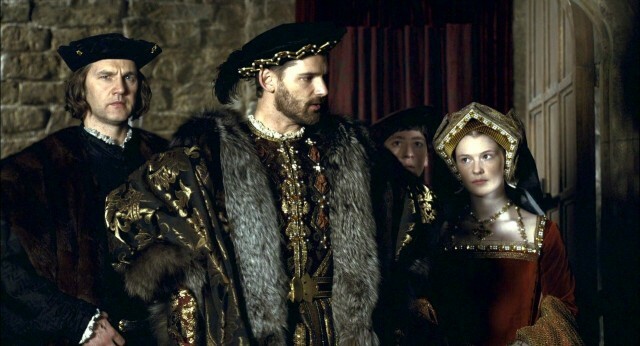 This post will cover Jane Seymour as she’s been portrayed up until now, and then I’ll follow this with another post specifically on her portrayal in Wolf Hall. Looking very “Queen Mum” to me. Played by Wendy Barrie as a ditz, which is a lot more personality than most movies give her! 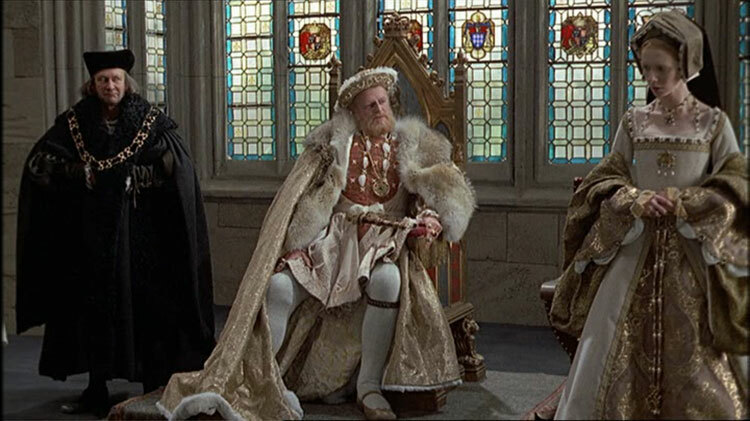 Henry-of-a-thousand-turkey-legs marries Jane Seymour only to have her die in the next scene. Do we think Jane could ever have been this interesting? Discuss. Yes, I watched what is probably the most boring episode of this BBC TV series (which I haven’t ever seen) FOR YOU. YOU’RE WELCOME. Okay, it’s not BORING per se — I actually think they probably had the best interpretation of Jane Seymour — it’s just slow. I admit, I still haven’t seen Elizabeth R either (except for the 1-2 episodes Trystan made me watch) because I missed them back in the 1970s-’80s, and now I have a hard time getting past the technological limitations (oh god, the LIGHTING in the indoor scenes! I know it’s not their fault, it’s what you had to do to film in the 1970s. But I’m spoiled). Anyway, Jane is played by Anne Stallybrass as good, kind, noble, and very wallpaper-y. I think it’s good casting — Stallybrass is clearly a good actress, and her look is right too (not unattractive but not attractive, and super super pale). Although I didn’t see the preceding episode, it’s clear that this Jane is the perfect antidote to interesting, exciting, and challenging Anne Boleyn. Jane is very happy living at home and probably would be very happy to be a country nobleman’s wife and run his estate, when the king notices her as the Anne Boleyn situation comes crashing down. She feels sorry for him, and so she sets out to be the mother he never had (okay, she doesn’t SAY that, but that’s how she clearly interacts with Henry — except when he throws a tantrum and reminds her that he could chop off her head if he wanted to). Jane is clearly smart and very religious and probably in many ways would be Henry’s perfect queen so long as she was fine with him having a fabulous mistress. She’s shown trying to influence Henry against his religious reforms (unsuccessful) and to reconcile with Princess Mary (successful), and she wrestles with her conscious about religion and Anne Boleyn’s fate … and then she has a baby and dies! Henry haz a sad! Yet another one I haven’t seen (can’t find it available for streaming and I’m not going to buy the DVD given the bad reviews!). Played by Jane Asher in this big-screen rehash of the 1970s BBC series. I’m going to assume it’s a similar, although abbreviated, story. You tell me — how does Asher compare to Stallybrass? Waiting in the wings when Anne died was Jane Seymour, a submissive woman of noble birth who seemed the perfect Tudor wife. Moreover, she was a devout Catholic, and the king’s advisors hoped her religious beliefs would bring Henry back to his original religion. Jane was active in politics, and went so far as to question her husband’s authority and nearly accuse him of treason. But her efforts to restore Catholicism failed. Meanwhile, Henry’s adoration of Jane remained strong. In 1537, Jane gave birth to a long-awaited son — an heir, Edward. Just 12 days later, she died from complications, leaving Henry beside himself. Hoping to allay his pain, and concerned that Edward would not survive long enough to inherit the throne, Henry sent his advisors out in search of yet another wife. 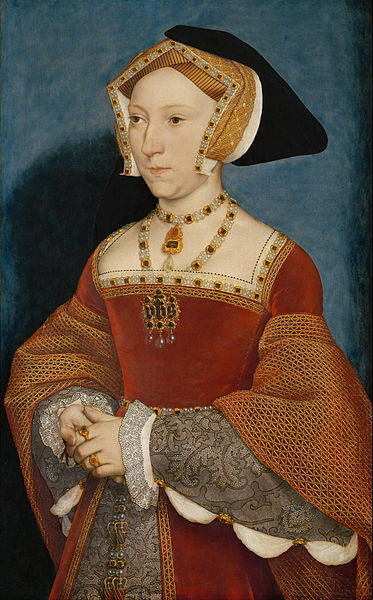 Just a few days after Anne’s execution, Henry marries Jane Seymour, a soft spoken and obedient woman born from an aristocratic, political family. Jane had been one of Anne’s ladies-in-waiting, and after her execution, she forbids anyone to wear revealing French dresses, which pleases Henry. Because of her strong Catholic beliefs, many hoped she would bring the king back to the Catholic faith. However, Henry remains strong on his religious stance and continues his position as Supreme Head of the Church of England. 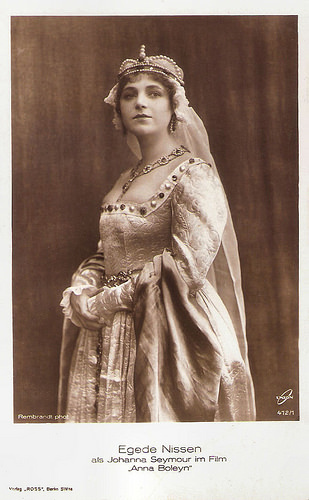 While Jane is submissive and obedient, she continues to be politically active, even going as far as to restore Henry’s first daughter, Princess Mary, to the throne, which Henry greatly discourages. Still, his love for her stays strong, and when she gives birth to a son, Prince Edward, Henry is overjoyed. However, Jane dies from complications just twelve days after Edward’s birth. Henry is devastated by the loss of his beloved wife. 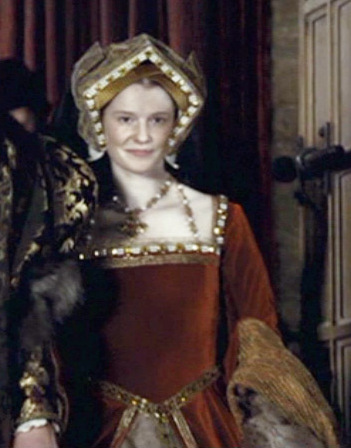 Is this the same dress Emilia Clarke wears (below in Henry VIII, 2003)? Why is Jane wearing so much rouge? Apparently played by Naomi Benson, but I can’t find any images and Trystan, who recently watched this (it’s been a few years for me), doesn’t remember any Jane Seymour action! I’m thinking this is Jane? Emilia Fox plays Jane Seymour as kind, quiet, retiring, and good. Really, in this production it’s more about Henry and how Henry treats her (read: not well). There’s one scene where he notices her at her family’s house, then we don’t see her again until after Anne is dead and the two are married. Jane attempts to comfort Henry as he grapples with his conscience, and manages to bring estranged daughter Mary to court, all has Henry glowers and looms. When Henry reneges on his promises of clemency to Robert Ashe and the leaders of the Pilgrimage of Grace, Jane speaks up for them, leading Henry to yell at her and hit her badly enough that she hits the ground. She then immediately goes into labor — a very shouty, bloody labor that, it is implied, is harder than it needs to be because of Henry’s abuse. She pops out the son, and then pretty quickly dies, again with the implication that this is because of Henry (it is mentioned she has a fever, but this is all played as “Henry beats Jane and that causes her death”). I will observe that Jane appears to my eye to be the best dressed (i.e.. most accurately) of the various wives in this production. Meh, but you can compare here with Queen Crushed Velvet (aka Anne Boleyn) and Queen Blood Red (Catherine of Aragon). I thought this dress was surprisingly decent! Minus its visor-y-ness, the French hood is actually pretty. 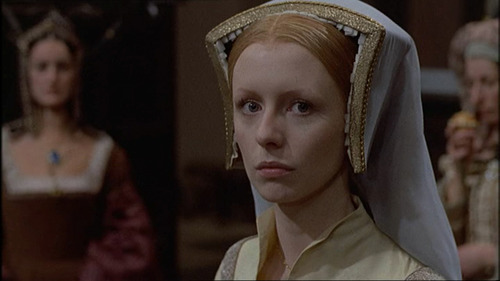 Corinne Galloway plays Jane sans dialogue in this film version — she’s simply there as a sign to those-who-know to confirm that Henry’s over Anne. She gets to hold his hand and sit on his lap — what more does a lady want out of life? The freckles are cute, but very un-Jane. Okay you guys. I must love you, because I just spent my weekend watching the Jane Seymour episodes of The Tudors,”and aside from our podcast, I hadn’t watched ANY of this show. This is love, right here. Annabelle Wallis plays the Best Queen Evah. She’s pretty, she’s demure, she doesn’t mind it if Henry messes around with other women, she gets knocked up, she dies. Okay, she does show some strength, attempting to influence Henry to get back to old school Catholicism and reconcile with his daughters. But she’s shown as being smart enough to get (evil, slicked back hair, weedy mustached) Henry’s ominous hints. Once he starts warning her to back the F off, she does, and goes for work-arounds that allow her to achieve her (very noble) aims without incurring his wrath. And actually, minus being extra-pretty (and wearing a 1950s sweater collar and other ridiculousness), I think this is portrayal is pretty spot on! Jane WAS the most pliant of Henry’s wives, and she certainly knew to shut it. Now, whether that would have lasted is hard to know, but given that she managed to pop out the boy, it would have been pretty hard for Henry to get rid of her when he inevitably bored of her. She probably would have done just fine, although she would have been quickly shunted off for more sparkly mistresses. So. I’d say in The Tudors, she was the Historical Perfect Compliant Wife. With a terrible wardrobe, but that’s par for the course in The Tudors. 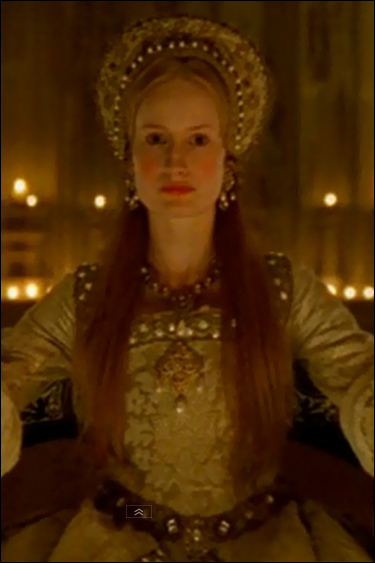 That collar should be in the top 5 most egregious crimes-against-history in The Tudors. I really hate this. The machine embroidered, totally-un-16th-century floral, the mixy-matchy fabrics. UGH. 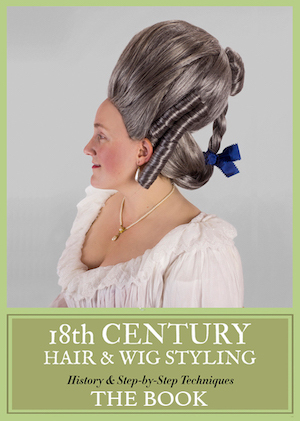 I’d like the standing lace collar, if it were about 1590! The princess seams. Oh, the princess seams. Which of these portrayals do you feel most accurately captures Jane Seymour? Is she Henry’s most boring queen? 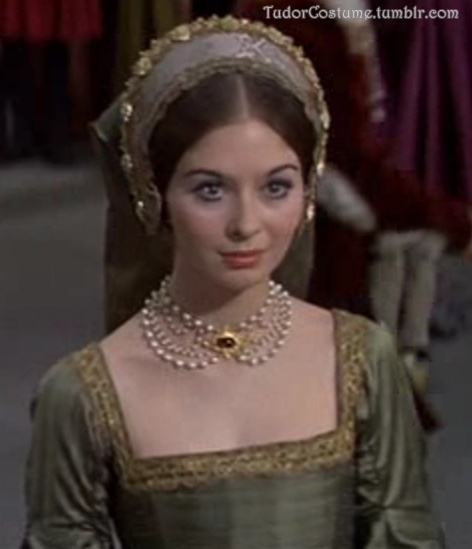 And, next, we’ll talk about Jane Seymour in Wolf Hall! At least the current actress has proved more interesting. I wonder how everyone resisted casting her as Jane Seymour? Quite enthusiastically agree about the 5 women. Aw, when I first saw this headline, I thought you were going to discuss the other Jane Seymour (of Dr. Quinn fame). The matching white wedding outfits in that last picture? The gold “embroidery” is actually glitter. I dressed these costumes in a TV costumes exhibition at a museum and they literally put glue in the desired pattern and then put glitter on it. I suppose it is a clever way to have a ton of embroidery without having to do a ton of embroidery but still. GLITTER. Ye olde glitter glue! I will never get over this, it’s a story I share often. I’m shocked, shocked, I tell you! HAHAHAHAHAHAHHAHA!!! !